I forgot to write this blog post after i had gone Plymouth with Tom the other week so i thought i would write it now. Me and Tom were originally going to go Bristol but Tom decided on going Plymouth in the end seeing as it was closer, so we went shopping! I was really happy because i could finally go to Primark as i haven't been in forever. It was so packed and hot when we went i thought i was going to faint or keel over and die. 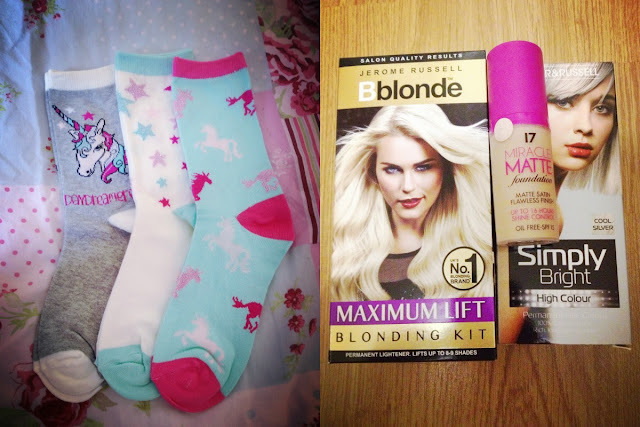 When i went into Primark i saw the My Little Pony T-shirt straight away and i couldn't help but buy it, i decided to get it in a bigger size so it was loose fitting and i could wear it over dresses and tops, then i saw unicorn sock and they were so cute so i got them for £2, i also brought a pair of navy blue leggings and two cute dresses, one is black and white with flowers and the other is black with pink hearts, they are really cute. After going Primark i wanted to find a nice pair of Vans so we went Soul Trader and i found a pair of blue navy ones which said they were £49 but i managed to get them for £39! Today i decided to go into town with my step dad and get some hair dye, so i got some hair bleach (for my god awful roots) and 3 packets of silver dye from pound land, seriously girls this stuff is awesome, i put it over my pink hair and now its baby pink/silver i love it! I also brought some 17 matte foundation to try out for £5.99. How cute is the Pony on my T-Shirt! It's my birthday on Thursday so i will be doing a blog post about it either on the day or a few days after, i am really looking forward to it!